We already have a Cultural Detective theme song (La Boca de Cultura) thanks to our multicultural, multi-talented friends Kotolán. I now suggest that, as do many nations of our world, we name an official Cultural Detective animal. And my nomination is the thaumoctopus mimicus. While many animals change shape or color, the Mimic Octopus studies others and then mimics their movements and their looks — instantly! And this octopus’ repertoire includes at least 15 different species! Come on, polyglots, global nomads, TCKs, and other blended culture people, can you top that? It changes its behavior to suit its environment, and its behavior is contextually effective. Sound like anyone you know? Wonder who teaches, trains or coaches these octopi? 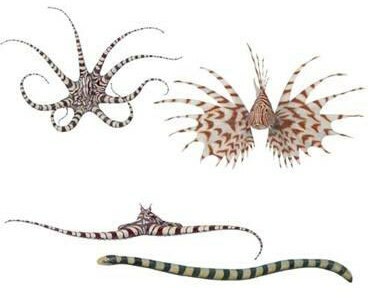 The thaumoctopus mimicus, or Culturoctopus Detecticus, would definitely seem to be one ethnorelatively developed, or, ahem, shall I say, “marizo-relatively” developed animal. Below you can view a short video of my nomination in action. Let me know if you have other nominations, or thoughts on this one! This entry was posted in Commentary and tagged Biology, blended culture, cross-cultural skills, Cultural Detective, global nomad, intercultural competence, Mimic Octopus, multicultural, Octopus, polyglot, TCK, third-culture kid, Zoology by Dianne Hofner Saphiere. Bookmark the permalink. Oh my gosh, what a cool animal!! I think it should have a cute name like Morffie. It’s a play off of the word morph (transforms itself into different shapes/looks) and Orff (Orff approach of teaching music, using many different approaches), and “ie” for the cuteness factor. I did see your kitschy names and they totally made me smile! Then I tried to say them out loud and was stumbling all over trying to say them and that made me laugh at myself. So I set out to find a name I could say. lol!! Thank you for the chuckle! And you taught me the meaning of “Orff.” Now I need someone to teach me music that way! Fabulous choice. Should definitly pick it – the message is very strong!